While enjoying and documenting our holiday in the U.P., my other blog has been shamefully neglected. I was reminded of this while cleaning up camp, when I found the political commentary pictured above on the door to the outhouse in the woodshed. 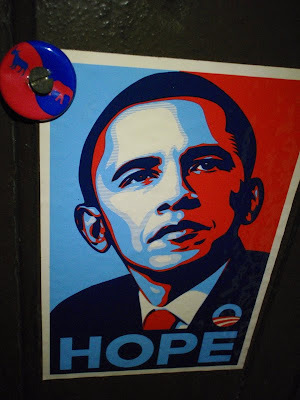 Last year, someone, not sure who, placed this Obama sticker on the old outhouse door. Subsequently someone, not sure who, offered a rebuttal by screwing a "Divided We Stand United We Fall" button to the sticker. The combined message is subject to several interpretations. Moderate independents and fiscal conservatives who believe in the kind of fiscal responsibility and careful governance that can found with divided government were screwed by the reality of the Obama administration. Instead of the moderate policies he espoused as a candidate, Obama has emerged as the biggest "borrow, spend and tax" Democrat in the history of the Republic. However, we can still hold on to the "HOPE" of divided government and fiscal sanity being restored in the 2012 elections. DWSUWF will be back in business soon.